Did anyone ever tell you that barley, the common cereal, was the favorite food of the gladiators? In fact, the gladiators were known as ‘hordearii’ which means ‘eaters of barley’. It was also an important food of the Greek and Roman athletes. The army of Julius Caesar mainly subsisted on barley while they conquered Europe. The Bible mentions the ripening of barley as the coming of spring. Barley is said to have originated in Ethiopia and Southeast Asia. Barley was the chief food plant of the Hebrews, Greeks, and Romans, and also many Europeans. All of them used barley for making their bread. It was also fed to animals and used for making drinks. The first known recipe for barley wine dates back to 2800 BC in Babylonia. Barley water was used as a medicinal drink from very early times. So you can say it is one of the earliest food crops grown by mankind. Barley is a cereal plant that belongs to the grass family called Poaceae. The Latin name for barley is Hordeum vulgare. The grain of the plant that we eat as cereal is also called barley. It has a rich, nutlike flavor and a chewy, pasta-like consistency because it contains a substance called gluten. Sprouted barley is high in maltose. Maltose is used for making malt sweeteners. When fermented, it is used as an ingredient in beer and other drinks. Barley is a very nutritious cereal because it is a good source of fiber and rich in selenium, phosphorus, copper and manganese. Barley also contains carbohydrates, some amount of protein, calcium, and vitamins. Barley cereal is one of the first solid foods given to babies. You can grow barley in a wide range of climates, more than any other cereal. It can be grown in warm climates, as well as cold; in dry climates, as well as wet ones. One can grow it in the slopes of the Himalaya Mountains and also in the near-desert areas of North Africa. They also grow in the cool, damp areas of Europe and America. It takes a shorter time to grow and ripen than any other crop. So they can be cultivated even during very short seasons. About half the barley grown in the world is used to feed animals. The rest is used as food and making malt drinks. But barley is not very good for making normal bread loaf because it contains gluten which is a little sticky and tends to make the loaf too solid. But barley flour is good for making unleavened bread, chapati, and pitta bread. It is especially good for making porridge. Barley is a staple food grain in North Africa and parts of Asia. In many parts of the world Pearl barley is the most popular form of barley used. Pearl barley is made from the whole grain from which the outer husk and part of the bran has been removed by a polishing process. Pearl barley is added to soups to make it nice and thick. It is also used for making barley water. Barley plants when dry turn to a soft straw. It is often used as bedding for animals. It is also added to other animal feed to provide roughage, which is an important part of their diet. 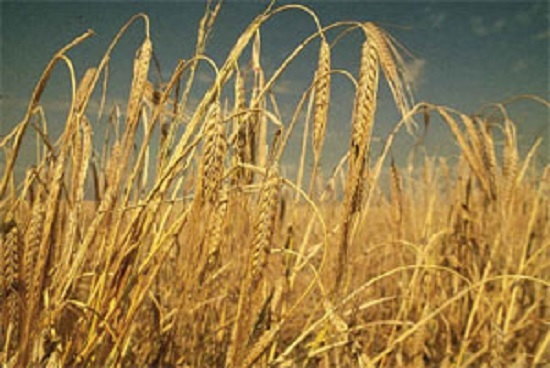 Barley is the fourth largest crop produced in the world after wheat, rice and corn. Today, the largest commercial producers of barley are Canada, United States, the Russian Federation, Germany, France and Spain.